Ready for match day in all conditions, catch with confidence wearing these adidas Ace Replique Goalkeeper Gloves in Energy Aqua, Energy Blue and Legend Ink. These quality goalie gloves for casual to amateur professional keepers have a positive cut which provides a greater surface area to improve your saving capabilities. 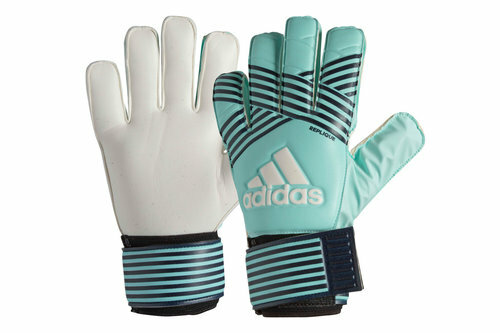 They also feature a smooth latex palm for improved grip and are adapted for both wet and dry conditions. For a secure and comfortable fit, a full wrap elasticated bandage fits around your wrist and is fastened by velcro. Pull off the spectacular with a pair of these adidas Ace Replique Goalkeeper Gloves, ideal for keepers looking for a reliable glove for all weather conditions.